Swarm is a new application by the developer of Foursquare, and depending on how you see Foursquare, you’re either excited about Swarm, or not interested at all. As far as I know, there are thousands of devoted Foursquare users, as much as there are thousands of those who don’t see Foursquare is anything appealing at all, with very few of us somewhere in between. Irrespective of whether you like Foursquare or not, it’s a solid social platform with its specific niche. 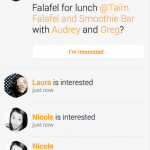 Swarm brings changes to the Foursquare app, taking away all the social features with it. The Foursquare has two main objectives – help you find new places, such as restaurants, clubs, pubs and bars, or cinema halls to hang out and visit, and see what your friends are doing. Now, Foursquare is separating these two spheres and leaving the initial Foursquare app with its primary purpose of finding cool places nearby, and creating Swarm for social needs specifically. We are expecting Foursquare app to be updated anytime soon, and the update will take away the social features from it, so if you want to continue using them you will have to download Swarm. Even though the very idea of having to use two standalone applications seems like a bad one, Swarm does have a charm to it – intuitive, beautiful interface is easy to manage and get hooked on. Swarm is perfectly integrated with Facebook messenger, text messages application and Twitter, provided you grant it the permission. What this means is whenever some of your friends is nearby, you can contact person in a matter of a tap by choosing how you wish to contact him – through Twitter, Facebook messenger, call or sent him a text message. Also, Swarm is directly integrated with Foursquare, and whenever you get the Foursquare friend request, you will receive it in Swarm, too. The app is perfect for the socializing butterflies looking who to hang out with now and then. In fact, Swarm is all about socializing. For example, the main screen of the app displays all your friends who are in the approximate vicinity near you. So, whenever you are looking for someone to hang out with, you simply launch Swarm and see who is nearby. 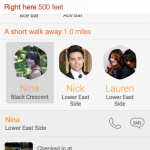 You can choose to contact the person from Swarm via one of the above-mentioned integrated apps. Far far away, anyone further away than 20 miles away, including people in other cities. Also, you can search for specific people in Swarm, provided they are registered, see where was the last place they checked in, and use one of the options to send them a text message, call or contact via Facebook. You can also view their Foursquare profiles from Swarm, and set up Swarm to notify you whenever a particular friend of yours checks in anywhere around you or anywhere in the city. At some point, Swarm resembles Facebook’s new feature “nearby friends,” with one crucial difference – in Facebook you may have plenty of friends from all over the world and when you see where they are through nearby friends, you see the world map. Whereas in Swarm, most users have friends from their real life, so meeting up is more of a possible option in Swarm than in Facebook, but I might be wrong here. It mostly depends where your friends hang out more – in Foursquare or Facebook. 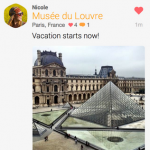 Making plans together is another awesome feature of Swarm. You can use the app when you make a plan and share it with other friends of yours on Swarm and just leave it there hanging in the open to see if some of your friends are willing to join. Anyone of your friends can leave their comments to the plan or just hit the “I’m interested” option. Mayorships as they were in Foursquare are gone, which may have made some users sad. For those of you who haven’t been very keen on Foursquare, here’s a little bit of history. Mayorships are achievements that you could unlock when you check-in specific location more than anyone else during a set period of time, so basically you become “a Mayor” of that place. Swarm makes it a bit different, because in Foursquare you would compete against the entire community, while in Swarm you compete only against your Swarm friends. Swarm also lets you collect stickers you can use to express your mood and attitude to the places you check -in. By default, you have six stickers and more are unlockable as you check into other places. 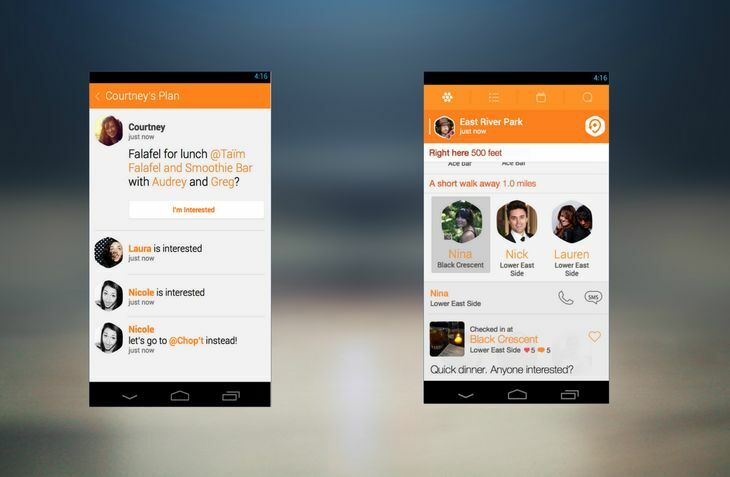 Finally, Swarm keeps track of your check-ins and gives you some interesting insight into your life. For example, it can let you know when you check-in with a specific friend of yours for the first time in a long period of time. Swarm is beautifully designed, ample enough for people looking to keep track of their friends whereabouts with be aim of meeting up and planning events together. It’s specifically focused on enhancing Foursquare’s social features, and its colorful design with perfect Facebook, Twitter and SMS integration makes it a must-have app for anyone who uses Foursquare on a regular basis. However, those of you who never managed to appreciate Foursquare, will probably pass on the new app. Swarm is beautifully designed, ample enough for people looking to keep track of their friends whereabouts with be aim of meeting up and planning events together.